The Rural Rambler: Public Input Needed For Ohio Department of Natural Resources Forest Strategy - Meeting This Wednesday and Surveys Online! Public Input Needed For Ohio Department of Natural Resources Forest Strategy - Meeting This Wednesday and Surveys Online! Make your voice heard! The Ohio Department of Natural Resources is currently holding a series of meetings throughout the state to gather public input regarding current issues, concerns, and opportunities for Ohio’s public and private forestlands. The Forest Resource Assessment and Strategy (FRAS) is a process that was set forth in the 2008 Farm Bill. This is an important activity where both citizens and forest-landowners can ensure that their perspective is documented and can help shape Ohio’s forest management objectives and strategies. 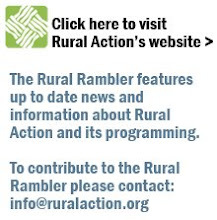 Rural Action is encouraging landowners and citizens to attend these meetings and voice their perspectives. Some of the issues and emerging opportunities that we hope to address include sustainable forest certification, tax policy and incentive programs, woody biomass harvesting guidelines and utilization, managed forest carbon programs, and poaching of high-value forest botanicals. In addition to public meetings, there will be a survey available online or by mail for those who will be unable to attend, or who would like to submit written copies of their perspective. Visit http://www.ohiodnr.com/forestry or contact Cotton Randall (Cotton.Randall@dnr.state.oh.us) for additional details or to obtain a survey. The next meeting will take place at the Cox Arboretum in Dayton, 6733 Springboro Pike on this Wednesday, Jan. 13 at 12:30-4:00pm (map). UPDATE: The Athens meeting that was cancelled last week due to snow has just been rescheduled for Jan. 19th! Due to the inclement weather, this meeting has been cancelled and rescheduled for Januay 19, 1:00 - 4:30 pm.